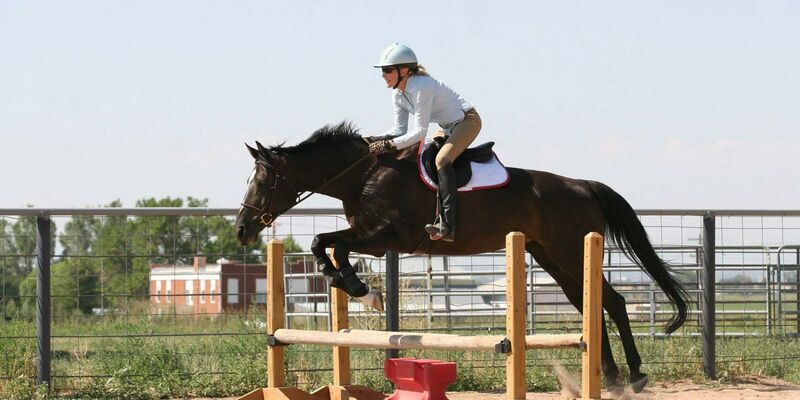 Volte is a small dressage, eventing & hunter/jumper facility just 25 minutes north of Denver with full-care boarding and training services. We pride ourselves on meshing a warm, down-to-earth atmosphere with a high-quality equine boarding facility. As a result, our students and boarders truly enjoy coming to the farm, as a social gathering place, a place to improve their riding and to bond with their four-legged best friend. On our spacious 25-acres we have an indoor arena, a regulation sized dressage court, a large outdoor arena with jumps available, a riding trail around the perimeter of the property and a large galloping field. We also have an indoor tack-up area with plenty of storage, hitching posts and an outdoor wash rack. Horses are fed quality hay and/or alfalfa twice a day, grain plus your supplements once a day, and have access to heated automatic waterers at all times. We live on site and care for your horse like its one of our own! Our spacious paddocks allow horses to romp at their leisure or nap peacefully in the shade of their shelters. Offering lessons from beginner levels all the way through advanced. Starting horses using natural horsmanship methods and a solid foundation in Dressage.